Weather: Mostly overcast but some breaks. Relatively mild for December. Light Breeze with very occasional strong gusts. 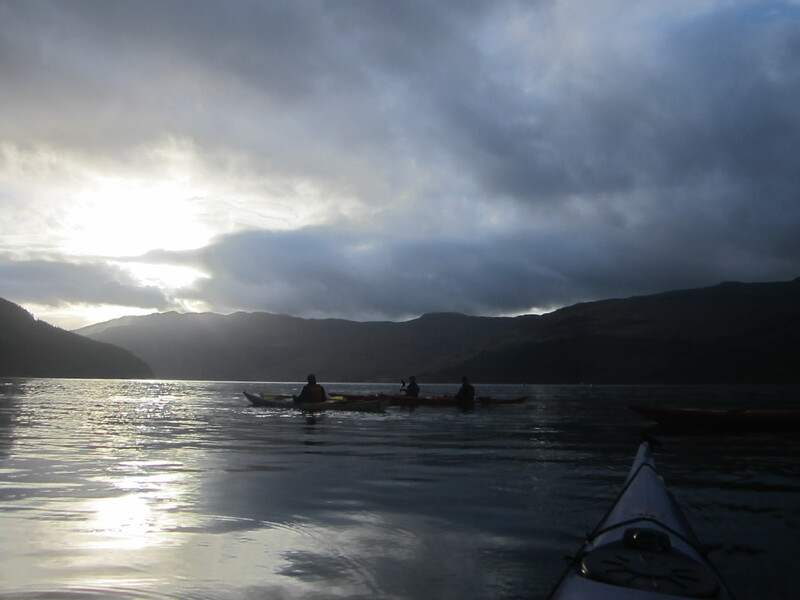 Report: The trip was set up for the forecast break in the grey, wet and windy weather. 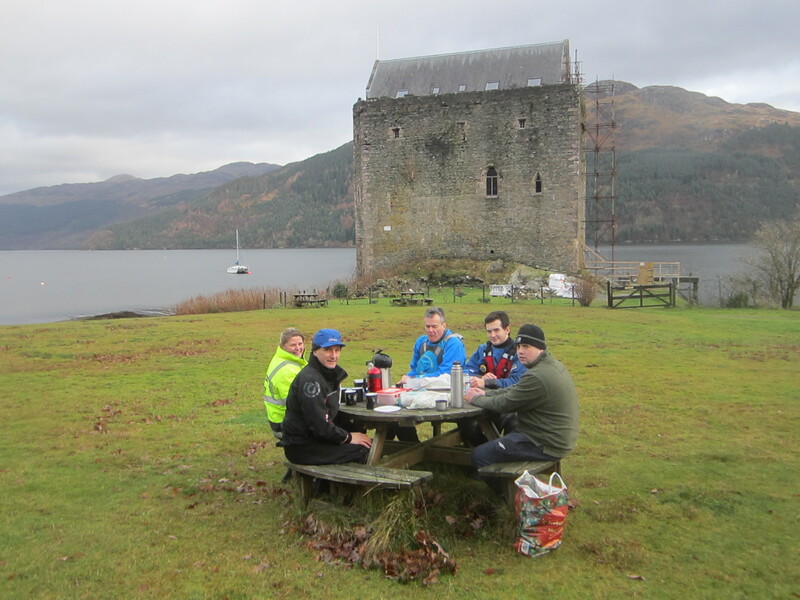 The five of us assembled at Finnart at the usual entry point at 10am. 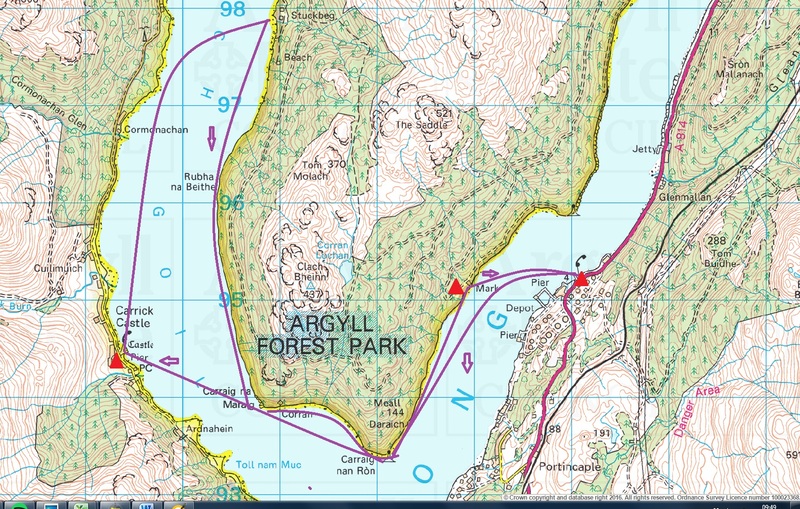 This launch point has degenerated over the years and the jetty some 800m further north is preferable. The crossing to Mark and the paddle south and west to Carrick Castle was uneventful except for a strong squall at the lighthouse. At Carrick a large timber carrier, the Red Princess, was loading. The RED PRINCESS is a passenger/landing craft and is currently sailing under the flag of St Kitts & Nevis. RED PRINCESS has 63m length overall and beam of 14m. Her gross tonnage is 498 tons. Built in 1970 as F/B Aspasia, a Greek passenger/cargo ro/ro, she was converted in an Athens shipyard to a timber carrier specifically for use in Scotland. On the beach at Carrick we were met by Vonna and her lovely collie dog. The offer of tea/coffee and a homemade mince pie was gratefully accepted. As we finished an enjoyable and prolonged break there was slight panic as Colin’s boat decided to float off on the incoming tide. It was easily rescued however and we set off up the loch with litle defined objective, other than to get back before dark. The seals that often inhabit the point north of Cormonachan were absent so we crossed over to the cottage at Stuckbeg. 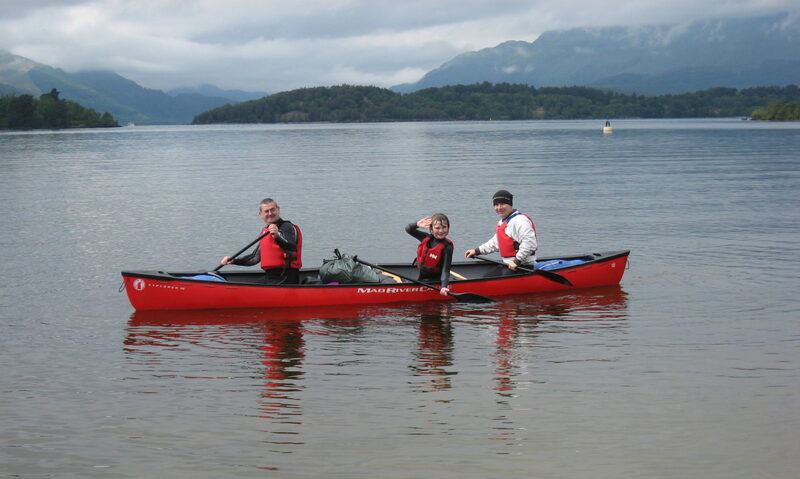 This very attractive cottage/house, like Corran, is only really accessible by boat. At Stuckbeg we found the seals who surrounded the boats quite warily. From Stuckbeg we headed back up Loch Goil and then Loch Long to visit the MBA bothy at Mark where Colin was delivering reading matter. In the bothy were 4 gents from the central belt gathered round a roaring fire with a few cans of beer. There was a slight interlude whilst Geoff explained and fitted a mantle on a new gas lantern for them. 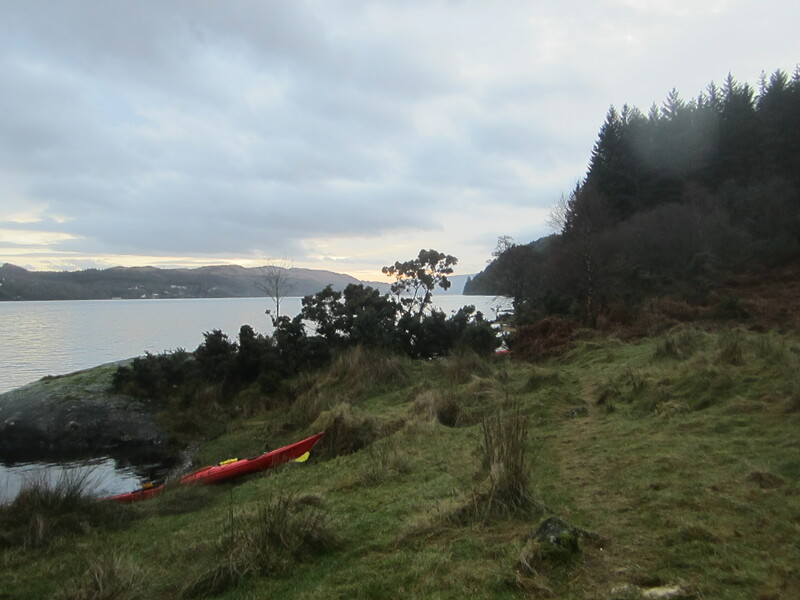 From Mark it was back to Finnart arriving in the gathering gloom arriving about 15.15 having covered some 16-18km. 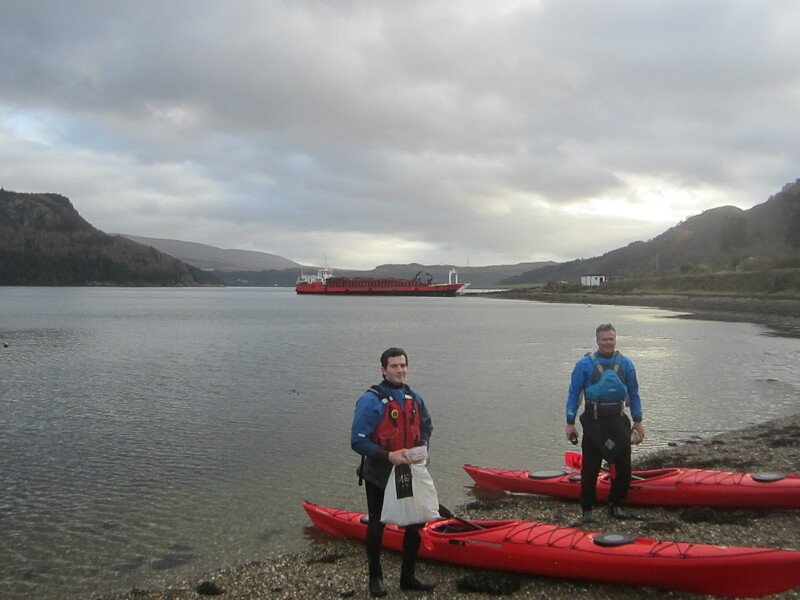 Overall the paddle was attractive and relaxing with the highlight being the mince pies at Carrick Castle.